A top Argentine Treasury official is hopeful a final joint statement will be possible at the Group of 20 summit that began Friday in Buenos Aires. Laura Jaitman says world leaders have made progress in talks about the challenges of the global economy regarding finance and trade. She adds that U.S. President Donald Trump is "very active and committed" in the dialogue with all members. European officials said earlier that the U.S. is blocking progress on agreeing how to fix world trading rules, fight climate change and deal with migration. 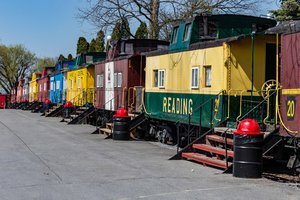 Jaitman says that "there's a very positive message of how trade has been an engine of growth for the next decades and how it will continue in the future providing benefits for all citizens." Vladimir Putin found an unusual way to explain why Russia was justified in seizing Ukrainian naval ships near Crimea - he took out pen and paper and drew a map. Officials in French President Emmanuel Macron's office say that when Putin and Macron met Friday, Putin pulled out a sheet of white paper and sketched out the Ukrainian coast and the disputed waters where the weekend incident took place. 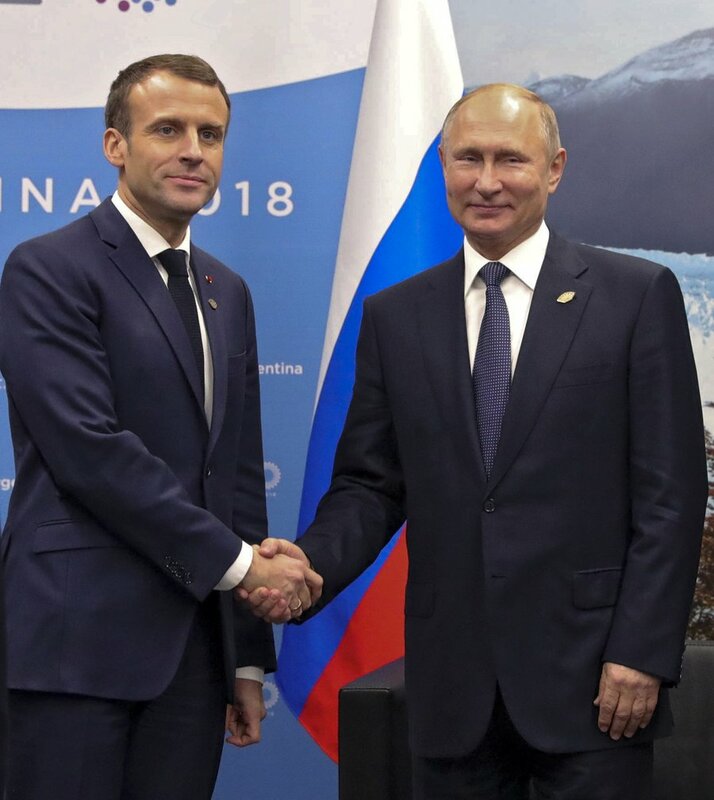 The French officials say Macron asked for documents proving Russia's claims, and insisted on the need for restraint in the conflict. Ukraine contends its ships were in international waters, while Russia claims the boats violated its maritime border. Russia annexed the Crimean peninsula in 2014, and neither Ukraine nor Western powers recognize the territory as Russian. Thousands of demonstrators are flooding a downtown avenue in Buenos Aires to protest the Group of 20 summit taking place in the Argentine capital. They're waving flags and holding up banners with slogans like "Go away G-20" and "Go away Trump." 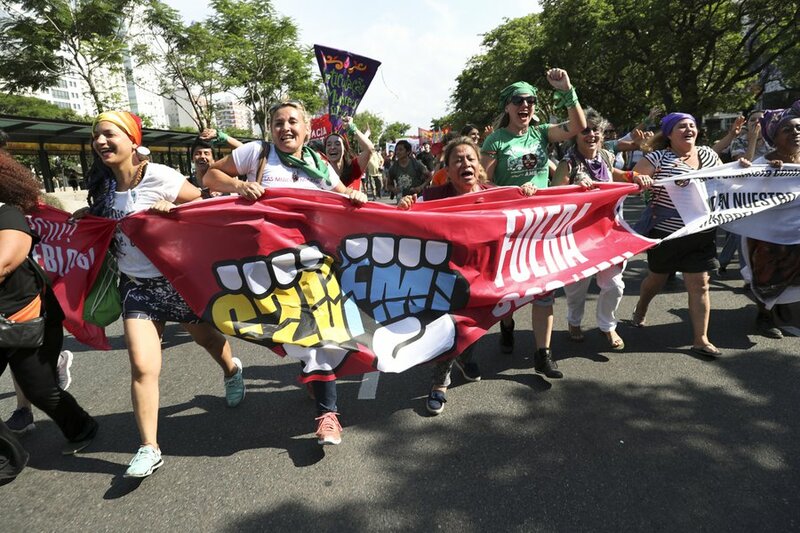 Activists from France, Germany, Italy and several Latin American nations are taking part alongside Argentines in a demonstration organized by left-leaning groups and labor unions. It's occurring more than 6 miles (10 kilometers) from the summit meeting. 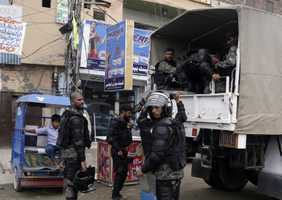 About 22,000 police officers and other security forces are guarding the leaders during the two-day summit that began Friday. 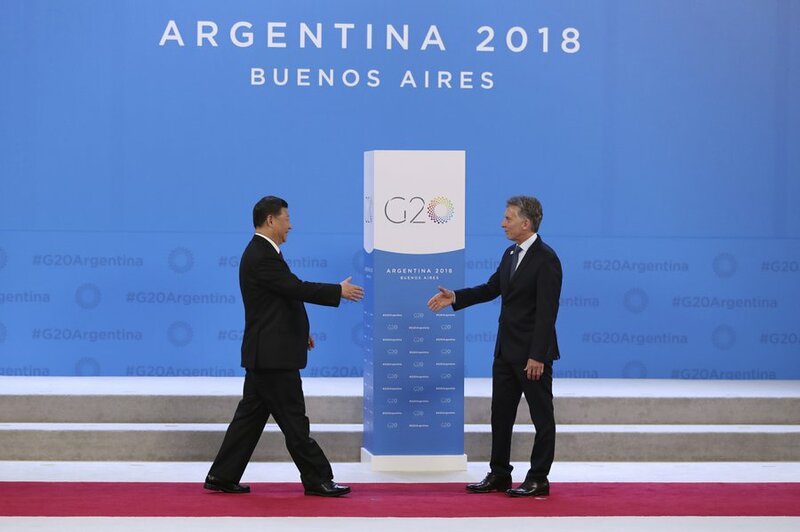 Argentina is the first South American country to host the G-20. 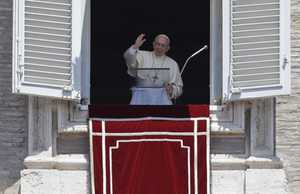 Argentine authorities have said they will not tolerate violence or allow the gathering to be disrupted. A senior Argentine official is pushing back on a remark by White House Press Secretary Sarah Huckabee Sanders suggesting that Argentina sides with the United States in its trade war with China. Sanders said Friday that Presidents Donald Trump and Mauricio Macri had "reiterated their shared commitment" to face challenges that include "predatory Chinese economic activity" during a morning meeting on the sidelines of the G-20 summit. 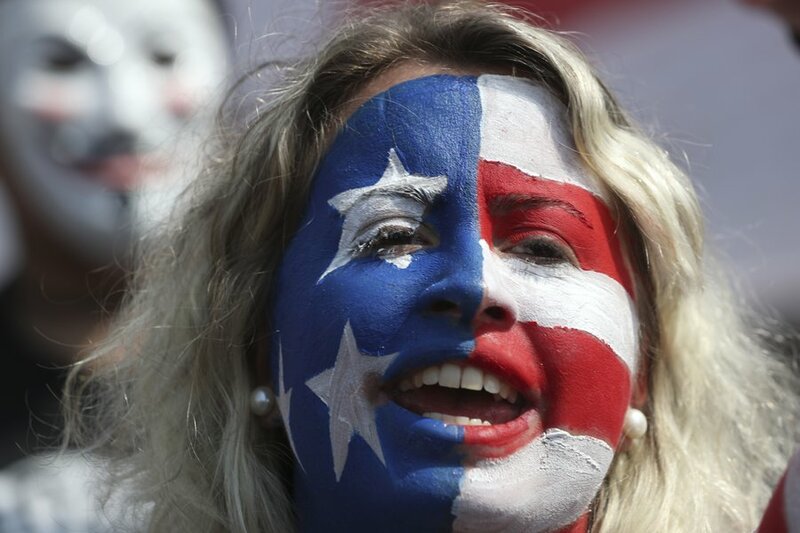 The official told The Associated Press that the "adjective used by Sanders is too strong and doesn't reflect" Argentina's relationship with Beijing. The official was not authorized to discuss the matter publicly and spoke on condition of anonymity. 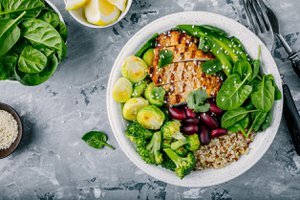 China is one of Buenos Aires' top trading partners and the main importer of Argentine agricultural commodities that are the backbone of its economy. 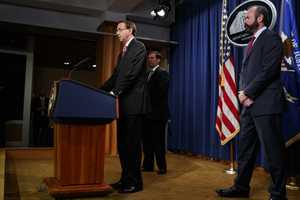 - Associated Press Writer Luis Andres Henao contributed to this report. 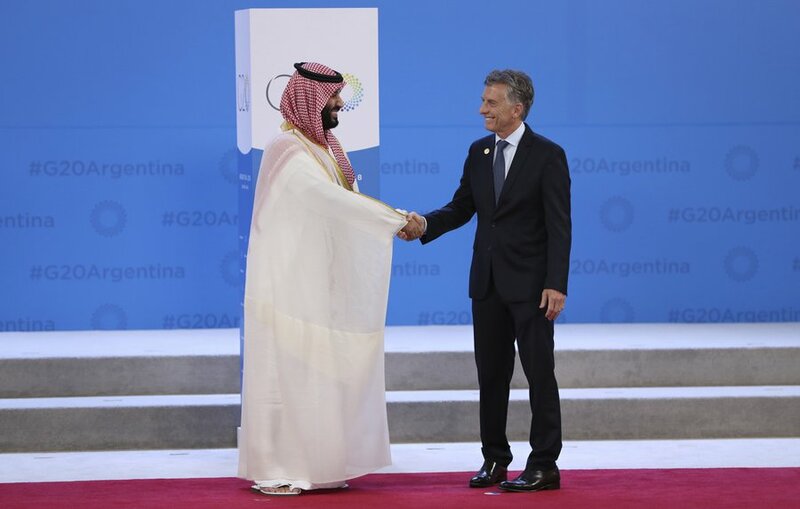 Russian President Vladimir Putin and Saudi Crown Prince Mohammed bin Salman have shared a smiley, enthusiastic greeting as the Group of 20 summit opened in Argentina's capital. 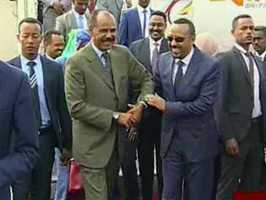 The two men beamed widely and clasped hands in something of a cross between a handshake and a high-five. The crown prince patted Putin's hand three times for emphasis as the two leaders took their seats next to each other. 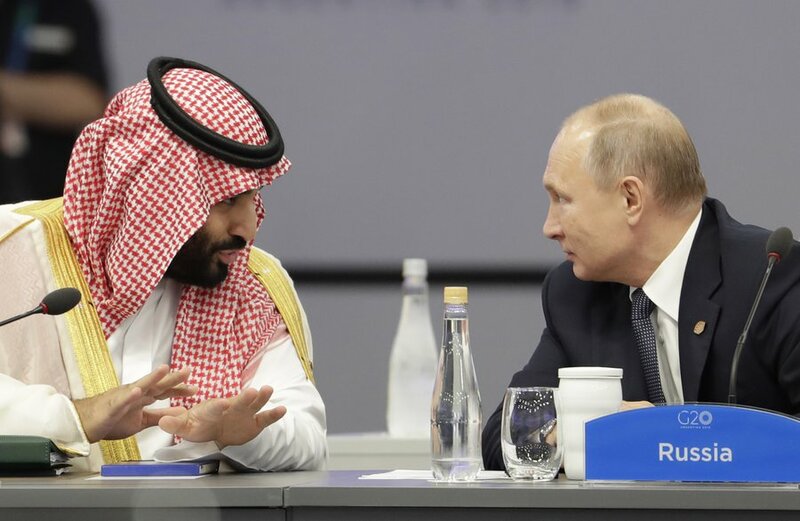 Putin and bin Salman are two controversial figures at the summit in Buenos Aires, having recently come under international criticism. In Putin's case, other world leaders have expressed concern over Russia's recent seizure of Ukrainian ships and their crews near Crimea. For the prince, it's about the killing of a dissident Saudi journalist in the country's Istanbul consulate. Saudi Arabia denies that bin Salman ordered the killing, but U.S. intelligence agencies have concluded the opposite. European officials say that the U.S. is blocking progress at the Group of 20 summit on agreeing how to fix world trading rules, fight climate change and deal with migration. Diplomats are working to come up with a final statement from the summit in Argentina Friday and Saturday that all leaders agree on. Because of resistance from President Donald Trump's administration, an official in the French president's office said that the statement may have language that sets the U.S. apart. For example, a draft says 19 of the participants agree on the importance of upholding the Paris climate accord, but the U.S. doesn't. The officials said the U.S. is also blocking any mention of migration or of reforming the World Trade Organization. 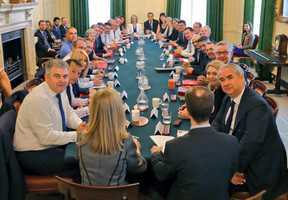 The officials were not authorized to be publicly named discussing the closed-door talks. European participants are trying to put up a united front at the G-20 and are concerned that Trump is using it to advance his own goals via bilateral meetings. 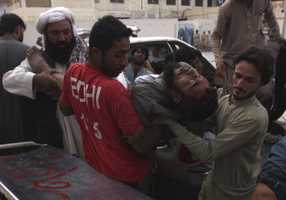 - Associated Press writer Angela Charlton contributed to this report. Argentina's president has opened the Group of 20 summit with a call for member nations to support international cooperation and multilateralism. 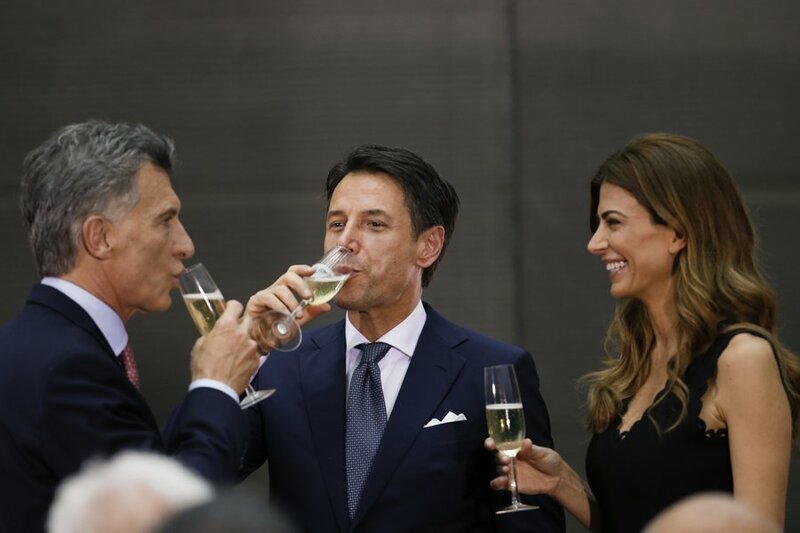 Mauricio Macri said Friday that the gathering of major economic powers will focus on issues such as labor, infrastructure, development, financial stability, climate sustainability and international commerce. He added that it will be an agenda "centered on people." 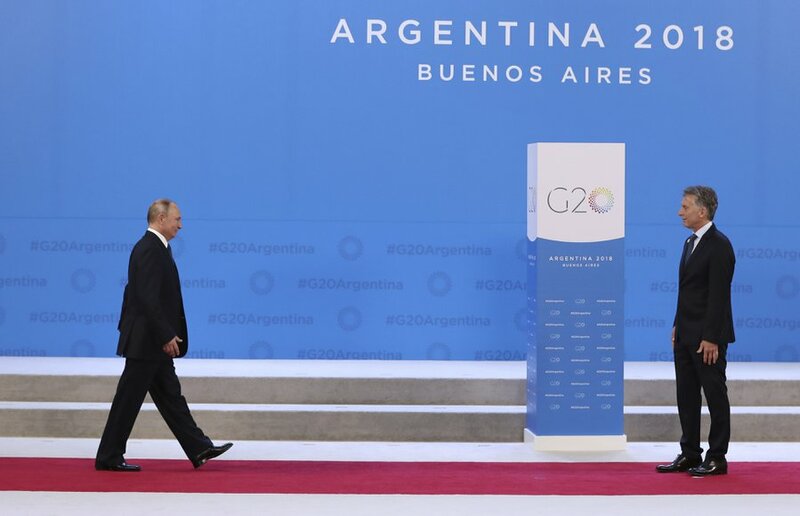 Macri acknowledged divisions within the G-20, but said "consensus is not something that is built overnight, but a process with advances and setbacks." He asked world leaders to have a "sense of urgency" and for actions "based on shared interests." Argentina's security minister is confirming that eight gasoline bombs were discovered in an area of the capital where a protest against the G-20 summit is expected later in the day. A police operation on Friday turned up the rudimentary explosives made from bottles and cloth wicks in a burned and abandoned taxi on the street. 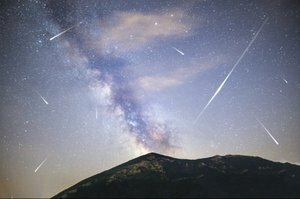 The site is more than 6 miles (10 kilometers) from the place where the summit is taking place. Security Minister Patricia Bullrich said that despite the find, "a day of peace and without violence is expected." Russian President Vladimir Putin says that the U.S. intention to opt out of a Cold War-era nuclear pact could trigger a new arms race. Putin spoke in Buenos Aires Friday at a meeting of BRICS country leaders, a grouping that includes Brazil, Russia, India, China and South Africa. He warned that Washington's planned withdrawal from the 1987 Intermediate-Range Nuclear Forces Treaty "creates risks of uncontrollable arms race." 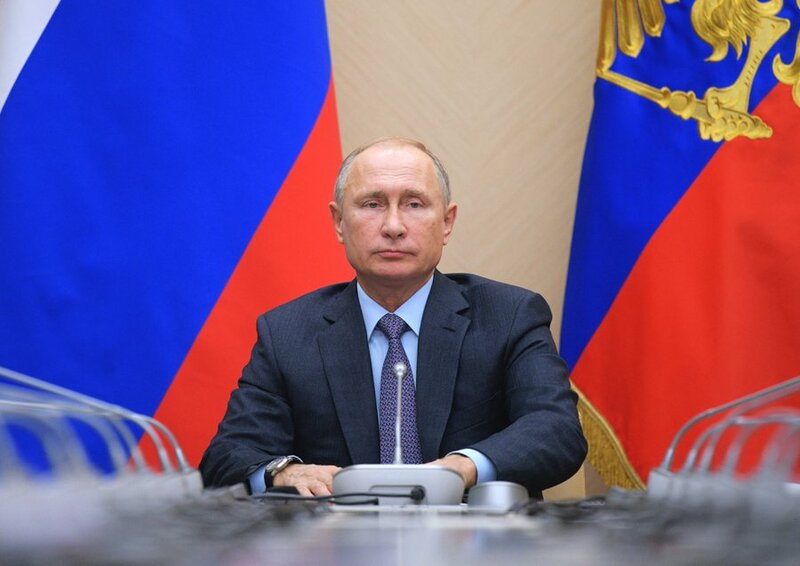 The Russian leader also called for securing a nuclear deal with Iran despite the U.S. withdrawal from it to "prevent a new round of tensions over the Iranian nuclear program." Putin hailed the U.S. dialogue with North Korea, but warned Washington against putting ultimatums to Pynogyang, saying that it could thwart the agreements reached. The meeting took place on the sidelines of the Group of 20 summit. Saudi Crown Prince Mohammed bin Salman has talked with world leaders at a Group of 20 summit clouded by concerns about the gruesome killing of Saudi journalist Jamal Khashoggi. 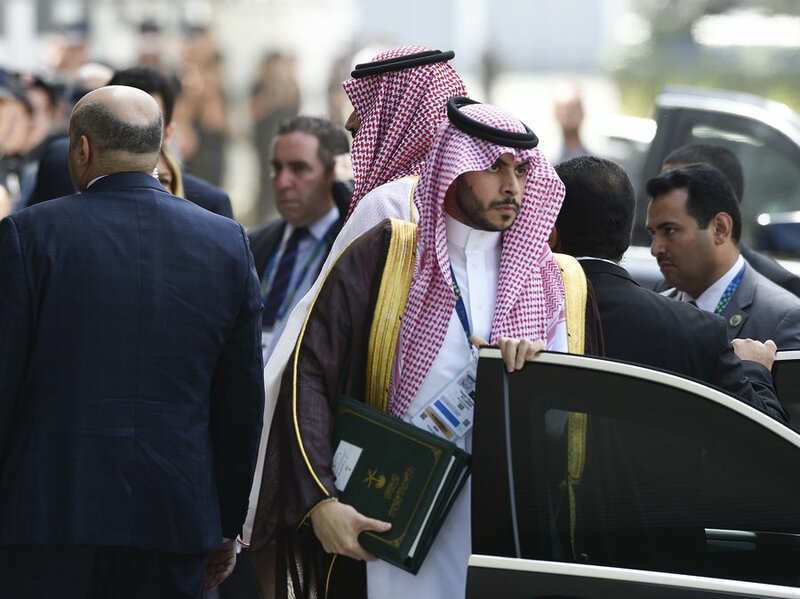 Journalists saw the crown prince speaking with French President Emmanuel Macron and others at the summit venue Friday in Buenos Aires. Macron's office wouldn't comment on what they discussed. On the eve of the summit, the French president called for international involvement in the investigations into Khashoggi's killing in the Saudi Embassy in Istanbul last month. EU leaders urged G-20 participants to address concerns about journalist safety and the Saudi-backed war in Yemen. U.S. intelligence agencies have concluded the crown prince ordered Khashoggi's killing. Saudi Arabia has denied that. 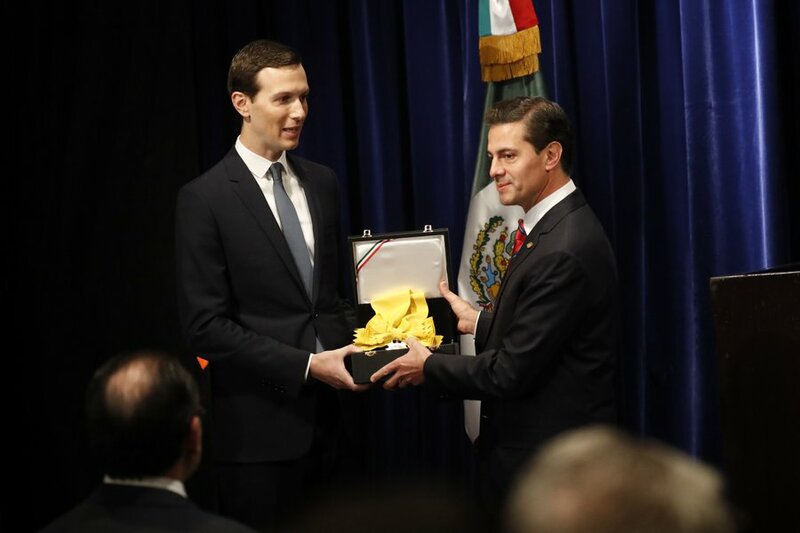 Mexico's government has presented President Donald Trump's son-in-law Jared Kushner with the highest honor America's southern neighbor gives to foreigners. Mexico's Foreign Relations Department says that Kushner earned the Order of the Aztec Eagle for his work on renegotiating a new trade agreement signed Friday by Mexico, the U.S. and Canada. The award has caused an uproar in Mexico, where many are angry over Trump's insulting comments about Mexicans. Prominent Mexican historian Enrique Krauze called the decision to give Kushner the award an act of "supreme humiliation and cowardice." The trade deal was signed on the sidelines of the Group of 20 summit in Argentina. It replaces the North American Free Trade Agreement, or NAFTA. 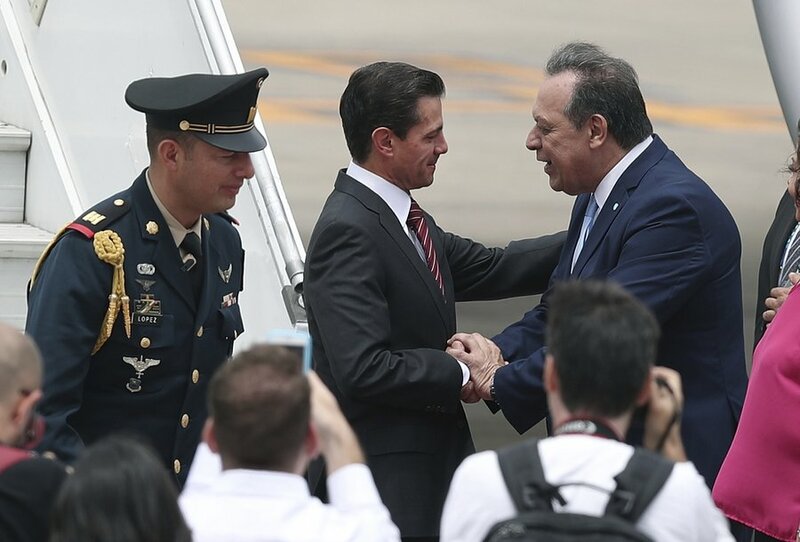 Kushner says U.S.-Mexico relations have improved because the countries decided to craft "win-win" solutions to migration, drug trafficking and other issues plaguing relations. The European Union wants world leaders to use a summit in Argentina to confront the Saudi crown prince over threats to journalists and the Russian president over his country's actions in Ukraine. EU Council President Donald Tusk spoke Friday at the Group of 20 summit and called on fellow leaders to discuss "trade wars, the tragic situation in Syria and Yemen and Russian aggression in Ukraine." He didn't mention the killing of Saudi journalist Jamal Khashoggi, but stressed the importance of the "basic safety of journalists" and said "it's our obligation to press our partners to respect these basic principles." 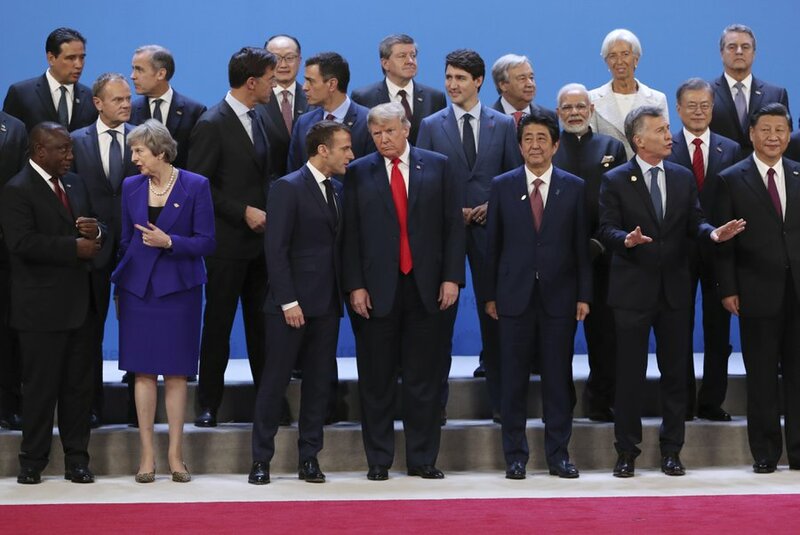 There are deep divisions among G-20 leaders and Tusk acknowledged that "this is a difficult moment for international cooperation." The summit opens Friday in Buenos Aires. European Council President Donald Tusk says the EU is expected to extend sanctions on Russia over its "totally unacceptable" seizure of Ukrainian ships and their crews near Crimea. Tusk said Friday that "Europe is united in its support for Ukraine's sovereignty and territorial integrity" and called the standoff "a cause of great concern." 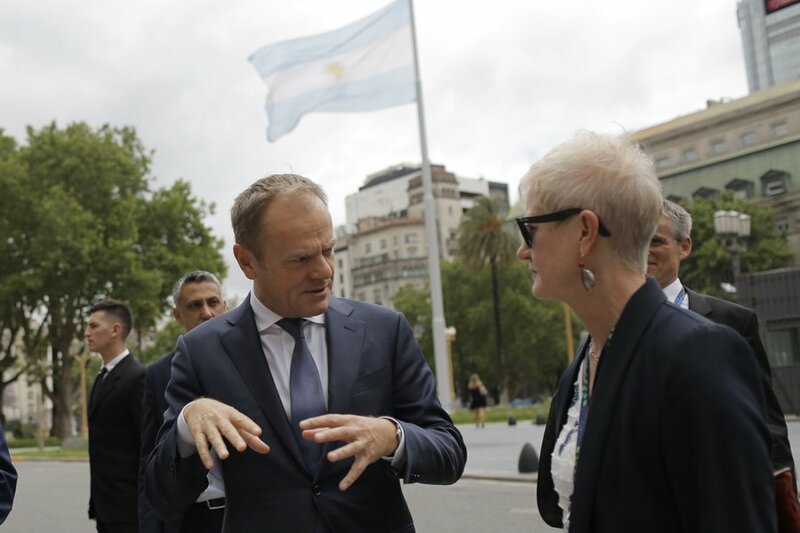 Tusk was speaking on the sidelines of a G-20 summit in Buenos Aires and he urged the leaders meeting to use the summit to discuss points of tension including what he called "Russian aggression in Ukraine." Russian President Vladimir Putin is among the leaders involved. Russia and Ukraine have traded blame over the ship incident. Diplomats from the G-20 countries are haggling hard over a final summit statement, with deep divisions over what language to use on the Paris climate accord and the World Trade Organization, according to two European officials involved in the discussions. Facing the prospect of a no-statement summit, European delegations are trying to create a common front and may come out with their own separate declaration if they can't get the U.S. or others on board. European leaders are meeting Friday morning at the summit venue to stake out common positions on trade, climate and the killing of Saudi writer Jamal Khashoggi. France is seeking to build coalitions on certain issues or "ad hoc partnerships" to try to salvage the spirit of the G-20 even if all countries can't agree, according to a French official. The officials weren't authorized to be named speaking about the closed-door discussions and spoke on condition of anonymity. Russian President Vladimir Putin has arrived in Argentina's capital for the Group of 20 summit, where a highly anticipated meeting with U.S. President Donald Trump was abruptly called off. Putin's plane landed Friday morning in Buenos Aires and he was greeted by officials on the tarmac. 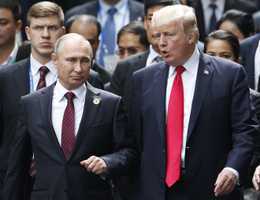 Trump tweeted on Thursday that he was canceling the one-on-one with Putin because of Russia's seizure of Ukrainian vessels near the Crimean Peninsula, which Moscow annexed in 2014. A Putin spokesman said the cancellation meant the Russian president would have more time for "useful meetings." German Chancellor Angela Merkel still plans on meeting Russian President Vladimir Putin for talks on the sidelines of the Group of 20 summit in Argentina despite her delayed arrival. Merkel's arriving later than intended because a technical issue with her government plane forced her to change plans, but spokeswoman Martina Fietz said Friday she'll still meet one-on-one with Putin on Saturday morning. 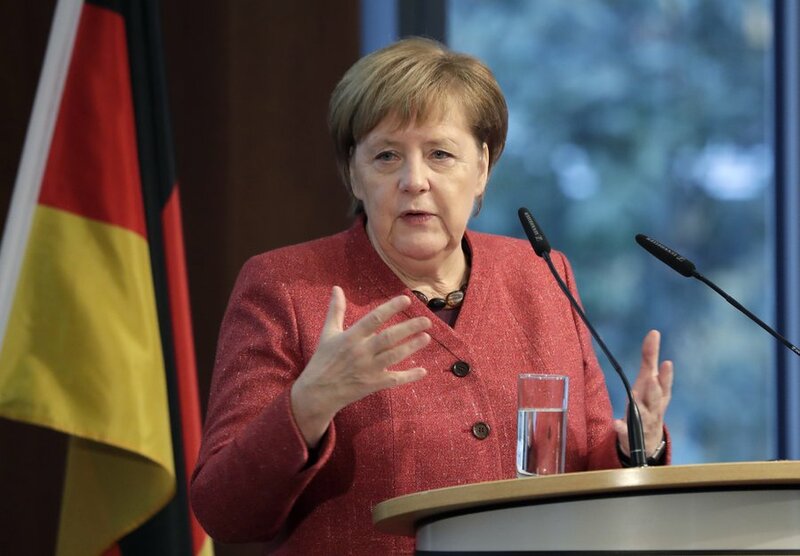 On Thursday, Merkel said she hoped to use the meeting to press Putin to deescalate tensions with Ukraine over the Russian seizure of three Ukrainian ships in the Sea of Azov. Germany's calling for the ships and sailors to be released, and is trying to help bring about a diplomatic solution to the crisis. German Chancellor Angela Merkel is finally on her way to Argentina for the Group of 20 summit after a technical problem with her plane forced her to change plans and stay overnight in Bonn. Merkel's office says she and a small delegation, including the finance minister, took a different government plane to Madrid on Friday morning, and then boarded a commercial flight to Buenos Aires. 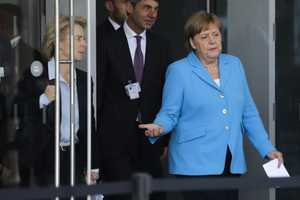 Merkel was en route Thursday night on an air force plane, but turned around over the Netherlands after the captain reported a technical problem. The plane was diverted to the Cologne/Bonn airport and landed without incident. 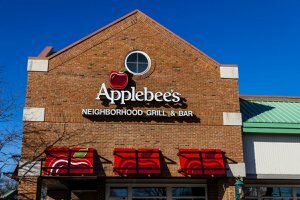 The problem is being investigated but the air force says it appears to have been an electrical issue that could have affected the radio system and a fuel system. Leaders from the world's leading economies were invited to the Group of 20 summit to discuss development, infrastructure and investment. 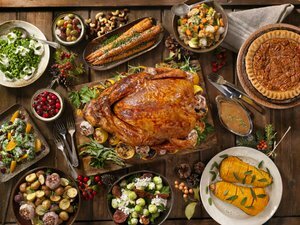 As the gathering officially kicks off Friday, those themes seem like afterthoughts, overshadowed by contentious matters from the U.S.-China trade dispute to the conflict over Ukraine. 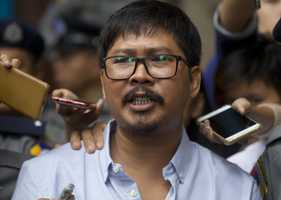 Also expected to loom large are tensions between longtime allies the United States and Europe, the gruesome slaying of a dissident Saudi journalist and how the Saudi crown prince who is alleged to have ordered the killing is received by world leaders. The U.S., Canada and Mexico also are supposed to sign a trade deal replacing the North American Free Trade Agreement that was struck following months of tough negotiations that analysts say left a bitter taste among the partners.